How some furniture entrepreneurs are turning the tide in a negative business climate. Yes, I do. And there is truth in the observation that public confidence has been seriously eroded by the media, which seems to put a maximum-negative spin on everything. Their underlying take home implication is that Washington must fix things, and do so soon. However, I can assure you that Washington never does fix all that much. Never has, never will. The home furnishings industry will be fixed by the same breed of mavericks that have fixed it so many times before—the ones who innovate and dare in the face of challenge. They are not necessarily the big shots. These are not the guys with a cushion of millions of dollars who can afford to wait things out. These are individuals who do not have that luxury, who are striving to find ways to turn the tide now. They are more than survivors, the “spirit shines through” them. Good question. Regarding your personal brand, your associates, customers, and vendors will not value so much how dynamic and charismatic you are. They may not remember much about how you look, what you say, how you say it or what you do. If all you are thinking about is you, you have it wrong. What customers, associates and vendors will never forget is how you make them feel. Your personal brand—and your store’s brand—are all wrapped up in how you make other people feel. Randy Terrio is accustomed to the rugged winters of northern Minnesota, but last winter was one for the record books. In January, the temperatures were staying well below zero degrees, and February, normally Randy’s slowest month, was off considerably from 2006. So he was very nervous as he anticipated February of 2008. He knew that he needed to do something different, and it had to be a winner. Furniture North is an old-line store, in business since 1960. In normal business cycles Randy’s philosophy works well: Maintain good curb appeal, have attractive displays, and hire good, honest people. But the housing turndown and historic bad weather were taking their toll on sales. He had discussed the situation with his wife Kathy, and she encouraged him to fight, to dare to do something different. So he crafted a selling story and added a legitimate, irresistible offer to his marketing. The results were remarkable: Kathy and Randy doubled 2007 February sales, plus more than doubled 2007 March sales—even though his 5 week promotion ended March 17th. We work in one of the most challenging, exciting and noble industries in the world. But it is also one of the most demanding. Why do we do it? Especially now, when things are so tough? Let’s take a step back and briefly review our industry and our motives. Personally, I love the retail home furnishings industry because we have so many unparalleled opportunities to enrich people’s lives. You remember, don’t you? You have done it so often it is second nature to you now. Remember how hard you worked to make sure that a family’s dad got his recliner in time for Father’s Day? And how you invested so much time to make sure that a young couple was able to furnish their new home in an affordable way? If you are a rep, remember how you worked to help that dealer find a way out of his cash-flow problem? Or, as an entrepreneur, how you sat down with that sales person and restored her self-confidence? Without exception, the dealers I talk to agree that the mainstream media is hurting business. If my information came exclusively from the mainstream media I would be depressed too. My job as a consultant, however, is to probe deeper. For example, gas prices. Contrary to conventional wisdom, Kiplinger’s famous letter tells me there is another bubble about to burst, this time all for the better. About one quarter of the price of oil is on the future’s market, and cannot be sustained. The prediction: crude oil will average out to $96 a barrel this year. No recession, the economy will grow at a slow 1%. Trends magazine crunches the numbers and also predicts slow growth, but no recession, gas under $100 a barrel and a 15,000 Dow by the end of 2008. The bad news for the furniture industry is that the housing market will continue to suffer into 2009. So, how do we survive until then? While it is true that people are still buying furniture, they are not responding to traditional media and the old appeals. So, what do we do? Rather than feed you advice from an ivory tower, let’s look at four stories of real furniture entrepreneurs in real time. Careless ads equal reduced effectiveness. This ad was well designed, has adequate copy, and yet its impact is hopelessly compromised. The headline states: “Pick a Room” and then promises that I can, “Create a room full of comfort for one low price.” So far so good, but the rest has nothing to do with a room group purchase. It is all price-item and credit offer, but nothing about this being a decorator-coordinated room, designed by an expert to be fashion-perfect and mistake-proof. The “Pick a Room” theme suggests that I can select from several rooms. Although this retailer has many beautiful decorator rooms, no mention of this is made. The reverse side of the flyer features two other rooms but they are not priced as groups either! Modern customers will not take time to figure out what is meant by “one low price” nor to determine the advantages. Fortunately, Randy and his wife refused to stay frozen in the headlights. And then, in the face of Minnesota weather that only got worse, they followed through with their decision to promote while other stores were pulling in their horns. The message to take home is that if you think hard enough, you will discover new possibilities and options to act upon, even in the toughest of times. Hineline Home Furnishings is a traditional family-owned store that has operated in Harlan, Iowa since 1961. In a small city (population 5,500) and in the virtual shadow of Nebraska Furniture Mart, Gary Hineline has managed through some challenging times. The current downturn did not seem to faze him when he announced to his general manager, Linda Knoell, that he had purchased a large, vacant building and was going to open a new store in Storm Lake, Iowa. Linda was taken aback. Kyle Beggs, the general manager of Hineline’s other location in Maryville, Missouri was equally surprised. At this writing Storm Lake is preparing for its grand opening. “The huge building is gorgeous and the community is welcoming us with open arms,” Linda said. The Hineline team is geared up and the morale is high. The soft opening is going well and things look great. Gary Hineline can be proud that they dared to expand with a new location in such challenging market conditions. Dwight Woods of Lawrenceburg, Tennessee never fails to be positive and full of ideas. While many furniture dealers are hunkering down and waiting for an upturn, Dwight decided to expand the Middle Tennessee Furniture & Appliance Outlet and rock his market. He planned to liquidate his entire television department and replace it with a more profitable floor covering program. He was going to do this by absorbing a successful local carpet store. Naturally, this called for a dynamic promotion. One of the first lessons a copywriter must learn about selling is wrapped up in this principle: People do not like to read advertisements but they love to read stories. Here is how his story rolled out in his preferred customer preview letter. “Back in 1984 when we started business Ronald Reagan was elected to his second term in office in a big landslide, the Discovery Space Shuttle flew for the first time, and a movie titled Terms of Endearment won the Academy Award. As a retired school teacher and principal, I didn’t know much about running a retail business. But I had some common-sense ideas that seemed to some people to be revolutionary. 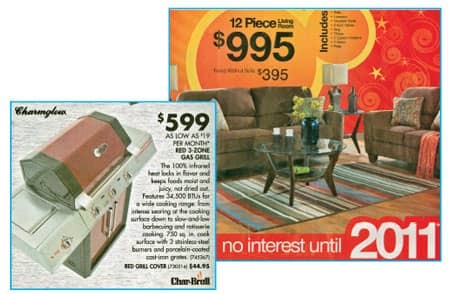 Copy starved furniture ad, but complete Information on the grill. Furniture retailers can speak eloquently about their merchandise, but in print, they are too often tongue-tied. 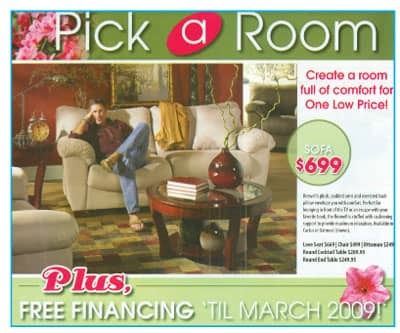 The half page furniture ad at left gives a group price, but only the purchased separately price of the “walnut” sofa. Not much information for the home maker who wants to know more about the value-added benefits this great company offers. presentations such as this. The take-home lesson: A smart furniture independent can learn—or assign someone to learn—to use selling copy and white space with many times the effectiveness of the lackluster efforts of many of the big boxes. This can go a long way toward leveling the advertising playing field. Dwight Woods has learned to connect with the Lawrenceburg community, population approximately 14,000. 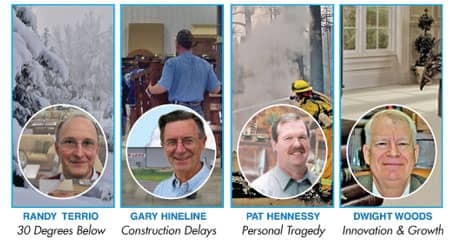 His theme “Good folks, great brands, low prices” may sound saccharine to a cynical ad man, but it resonates with a very neighborly community where citizens and officials work together for continuous growth and prosperity. I saved Pat for last because his story is both heart-rending and inspiring. It’s tough for a smaller store to do business in a big city when several big boxes dominate the media. This wasn’t so much the situation in Reno when Pat opened Classic Interiors several years ago. But since then Reno has become a bloody ocean of big box competition. To add to the difficulties of a smaller store, as the economy turns down there always seems to be an interminable GOB going on somewhere in Reno. Pat came to Reno with a partner, but he bailed out when the competition intensified. In spite of a less than ideal location and limited showroom, Pat gradually created a niche and built a following. He developed a relationship with India’s largest manufacturer and distributor of solid wood furniture made from Sheesham—an exotic two-tone hardwood. Pat was inspired to develop a company and create a distributorship for this product in America, Monsoon Pacific. This idea worked out well for him. The operative words are: “begin again.” Customers read this story and they responded. Not just to buy furniture. Many truly came by just to wish him and his wife well. His successful store-closing event has left him in a much more advantageous position. The sincere disclosure to the public preserved his integrity and left the door open for Pat to set into motion the second part of his strategy: Pat will revive his retail operation and sell to the public out of his Monsoon Pacific warehouse four days a week. Few other furniture retailers have been hit harder than Pat Hennessy. But through it all he has always been a gentleman, always courteous and cheerful. These attributes are a large part of Pat’s brand. Even as one venture folds for Pat, since he took steps to preserve his brand, his new venture has a much greater chance of success. We read enough of the tough times in furniture retailing. More needs to be said about the “ordinary” men and women who are out there making it work in spite of economic conditions, weather, and negative mainstream media. I hope these stories and exhibits inspire you to come up with solutions of your own. America’s recovery will spring from where it has always originated — in the inexhaustible energy of its grass roots. Next issue, we will pick up on the Seven Lost Secrets series. Larry Mullins is a contributing editor for Furniture World and has 30+ years of experience on the front lines of furniture marketing. Larry’s mainstream executive experience, his creative work with promotion specialists, and mastery of advertising principles have established him as one of the foremost experts in furniture marketing. His affordable High-Impact programs produce legendary results for everything from cash raising events to profitable exit strategies. His newest books, THE METAVALUES BREAKTHROUGH and IMMATURE PEOPLE WITH POWER… How to Handle Them have recently been released by Morgan James Publishing. Joe Girard, “The World’s Greatest Salesman” said of this book: “If I had read Larry Mullins’ book when I started out, I would have reached the top much sooner than I did.” Larry is founder and CEO of UltraSales, Inc. and can be reached directly at 904.794.9212 or at Larrym@furninfo.com. See more articles by Larry at www.furninfo.com or www.ultrasales.com.